The Honda City is the country’s subcompact sedan of choice not only for the motoring critics but the general public as well. Winning back-to-back recognition from two premier award giving bodies in the motoring realm, the introduction of the 3rd generation City early this year is a ground-breaking treat for the industry. 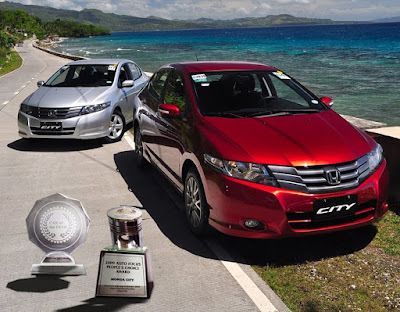 The Honda City is named the subcompact sedan of the year during the 5th Auto Focus People’s Choice Awards (AFPC) and the Car of the Year Awards (COTY). These awards groups aim to assist consumers in making a sound choice when purchasing a vehicle. From July to September of this year, AFPC empowered the general public to vote for their favorite automobiles. AFPC winners were determined by tallying all votes generated from online, newspaper, magazine and radio polls. AFPC has been running its search for the most popular and most appealing automobiles in the market for five years now. Meanwhile last October, the Car Awards Group Inc. composed of motoring journalists from print and broadcast media conducted qualitative and quantitative tests on qualified vehicles. Tested models included newly launched models with major modifications and those with upgrades that have effect on the power train, drive train or suspension. “These recognitions are very dear to us because these attest the local market’s warm appreciation of the third generation City. Year 2009 is indeed very significant for the City. The third generation City has not only been introduced at the onset of the year but is also on its way in setting a new sales milestone. With City sales averaging to 3,400 units per year, the new City already hit more than 8,000 sales mark with still one month to go before the year ends. We thank our dear customers and the motoring media for their nonstop support.” said Mr. Hiroshi Shimizu, President and General Manager of Honda Cars Philippines, Inc. The third generation City presents cutting-edge design and technologies that set new standards in it class. It bears sleek and powerful stance, spacious interior with advanced audio system and comes equipped with the i-VTEC engine technology. Merging modernism with practicality, the City simply changes the rules on how subcompacts should be like. Honda has earned good reputation for its unceasing quest to improve its products and services. The birth of the first generation City in 1996 was Honda’s response to the growing demand for automobiles in the Asian market. Through the years, the City’s over-all value for money package gained worldwide market acceptance as it came loaded with functionality features while keeping maintenance and fuel consumption costs low. Such key strengths paved way for the 3rd generation City to reach beyond Asia and Oceania and advance to the Middle East, Europe and Latin America. To know more about the award-winning City and their other cars like the Honda CR-V, visit any of Honda’s 26 authorized dealerships in the country. Be smart and schedule a testdrive.